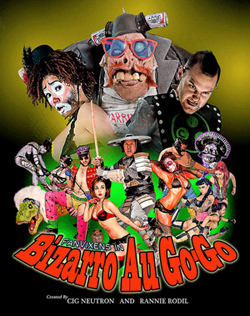 This update is a bit late, but Bizarro Au Go-Go had a booth at the 2012 Wondercon in Anaheim with Ink Pen Mutations Press. Here are some photos of the event. I was impressed with her costume made of duck tape and cardboard. ^Awesome Nathan Explosion. He was at LBCC as well. Maidbot 5000 makes a comeback. With our friend Richard Starking. Creator of the awesome Elephantmen. Vikings trying to get a taste of mamma rays from the mammaraygun.